The pharmaceutical excipients market is expected to reach $8.53 billion by 2023, up from $6.4 billion in 2018.1 Organic chemical excipients had the largest share of the pharma excipients market because of their increased efficacy in oral delivery and increased compressibility and flowability properties. Based on functionality, fillers and diluents dominated the market in 2017 because of their ability to improve taste and ease administration. Additionally, binders experienced growth as they be can co-processed to help overcome formulation obstacles and reduce development costs.2 In this annual Drug Development & Delivery report, some of the industry’s key players discuss the role excipients are playing in continuous manufacturing, biopharma formulation, and controlled- and immediate-release delivery. Large molecular size, poor aqueous solubility, susceptibility to changes of pH, and enzymatic breakdown are some of the common challenges facing biomolecules today. Such complexities may be addressed by advances in lipid-based formulations or solid dispersions involving polymer-lipid combinations. Otherwise, as poor oral candidates, biomolecules are formulated into injectable forms. Overall, excipients that may improve the dissolution of API and enhance API permeability across the biological membrane are of high interest to drug development scientists. Glyceryl behenate (Compritol®) is a different example among the Gattefossé lipid excipients. Ms. Musakhanian says it helps disperse the drug in a lipid matrix, providing protection against hydrolysis or oxidation for sensitive APIs, and taste masking or sustained-release profile depending on the percentage used. To achieve bioavailability, many formulators favor the use of amorphous solid dispersions. This will require using polymers as excipients that can form an amorphous embedding, and prevent recrystallization during storage, says Jessica Mueller-Albers, Strategic Marketing Director, Oral Drug Delivery Solutions, Evonik Health Care. Several polymers in the Evonik EUDRAGIT® portfolio, such as EUDRAGIT L 100-55 and EUDRAGIT L 100, have solid dispersion forming and recrystallization inhibition characteristics. However, Ms. Mueller-Albers says that, increasingly, solubility enhancement alone cannot fully address the therapeutic requirements of specialized drugs. That is why many companies are adding controlled-release features to their formulation after the challenge of solubility enhancement has been solved. Pharmaceutical formulators are seeking ways to improve the manufacturing process and product quality using multifunctional excipients, which play an important role in innovating delivery technologies and helping in-line extensions of marketed drugs. Moreover, multifunctional excipients can help pharma manufacturing through improved flowability, enhanced compressibility, improved bioavailability, and particle size distribution. Most of the excipients in BASF’s portfolio are multifunctional, meaning that one excipient is suited to meet multiple formulation applications. For example, Kollidon® VA 64 – a copolymer with vinylpyrrolidone and vinyl acetate – is a dry binder for roller compaction and direct compression applications, a film former for coating, and a drug solubilizer in melt extrusion. 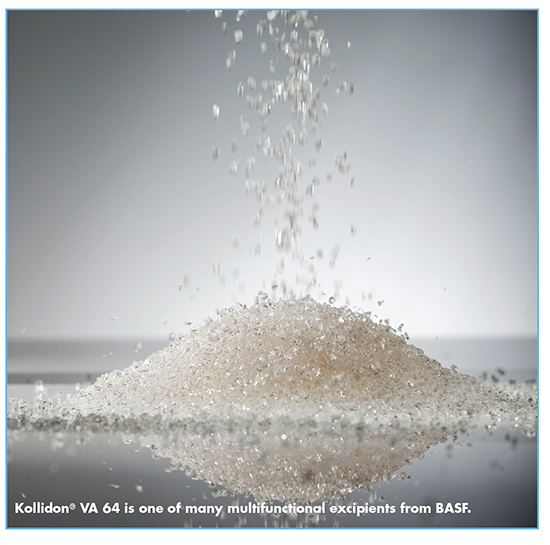 As a result, Kollidon VA 64 and/or Kollidon VA 64 Fine offer benefits for crystalline, poorly compressible, soluble or insoluble APIs. Other examples include Kollidon SR, a binder and matrix former for sustained-release tablets; and directly compressible excipients, such as lactose-based Ludipress® and mannitol-based Ludiflash®, both of which have been used as dry binders, pore formers for tailoring dissolution profiles, and ready-to-use formulations for tablets and orally disintegrating tablets. Dr. Karry says that raw material properties, such as bulk density, particle size, compressibility, and permeability play an important role in continuous feeding and ultimately the unit formulae of the product. She says that while equipment manufacturers can build controls to mitigate feeder disturbances caused by changes in material properties leading to densification and bridging in hoppers and screws, a complete understanding of the impact of flow properties in process and product performance is essential for continuous manufacturing. Mitigating biological production risks and improving process yield are also important and are driving demand for high-purity excipients. BASF’s Kolliphor® P 188 Bio is used to protect cells from shear stress and subsequently increase API yield. “As the industry interest in novel excipients continues to rise due to increase in BCS Class II and IV molecules, BASF is taking a more pragmatic 360-degree approach to address these challenges,” says Dr. Karry. 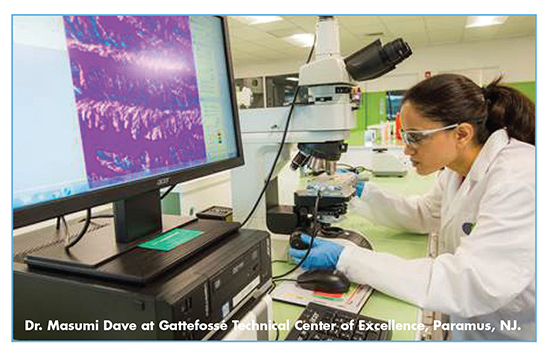 “BASF is building partnerships with drug manufacturers, contract research and manufacturing organizations, and equipment manufacturers to develop new polymers using individual monomers as building blocks for unmet formulation challenges.” Examples include the PVA-PAA, Soluplus®, and Kollicoat® Smartseal polymers derived from their respective monomer blocks. Growth in the pharma industry is a natural driver for the excipients industry, where there is a continuous push to provide functional excipients capable of solving modern formulation challenges. 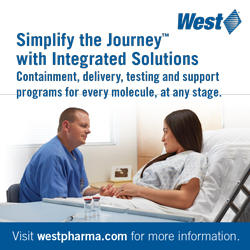 Multifunctional excipients produce a wealth of innovation within the biopharmaceutical industry. “A current example of this can be seen in Roquette’s novel cyclodextrin technology, Kleptose BioPharma,” says Peter Ferguson, Roquette’s Global Marketing Manager – BioPharma. “This multifunctional excipient provides biopharma formulators with a technology that is well established within small-molecule applications.” Mr. Ferguson explains that the technology is showing great promise in combining different functionalities, such as replacing polysorbates as surfactants while also providing a mechanism for protein stabilization. “This technology is allowing formulators to respond to market demands, such as managing product lifecycle via a transition from low concentration, powder formulations towards high concentration, liquid dosage forms, administered subcutaneously.” New data on multifunctional excipients in biopharma will be released throughout the year from Roquette. Pharmaceutical formulators are also seeking ways to improve the manufacturing process and product quality through the use of functional excipients. Selecting the best excipients, however, requires a balance between time and cost efficiencies as well as anticipated product performance. Multifunctional excipients have traditionally been widely used, often in combination with a range of other excipients. Dr. Rajabi-Siahboomi adds that the overuse of superdisintegrants often creates stability challenges, as well as increasing cost. One Colorcon customer (a large generics manufacturer) recently requested technical support to help reduce the defects observed on a coated tablet. Upon close inspection, the Colorcon technical team noticed that the coating showed discontinuities typically associated with the presence of superdisintegrants in the core. “Occasionally, superdisintegrant particles on the tablet surface can absorb many times their mass in water and disrupt film formation,” Dr. Rajabi-Siahboomi explains. In this case, the customer was encouraged to replace the binder and the superdisintegrant in the core formulation with Starch 1500®, a partially pregelatinized starch that functions as both a binder and distintegrant. 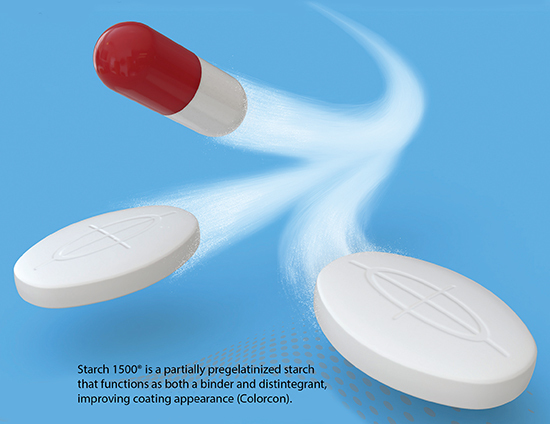 Starch 1500 is suited for moisture-sensitive formulations, acting as a moisture scavenger while producing a mix of tablet hardness and rapid disintegration. 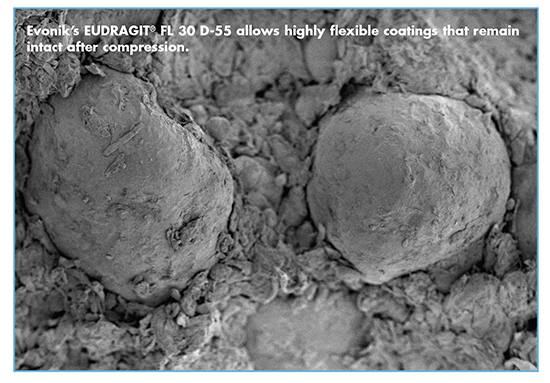 “Because Starch 1500 can function as a disintegrant without swelling to nearly the same extent as superdisintegrants, the tablet coating appearance greatly improved and the impact of moisture was eliminated,” he says. “The result was a significant improvement in the customer’s product appearance while simplifying the overall drug product formulation and reducing the number of excipients used in the manufacturing process. Pharmaceutical Excipients Market worth 8.53 Billion USD by 2023, Pharmaceutical Excipients Market, Markets and Markets, https://www.marketsandmarkets.com/Press-Releases/pharma-excipients.asp. Global Pharmaceutical Excipients Market to 2026: Size, Market Share, Application Analysis, Regional Outlook, Growth Trends, Key Players, Competitive Strategies, Research and Markets, June 15, 2018, https://www.globenewswire.com/newsrelease/ 2018/06/15/1525047/0/en/Global-Pharmaceutical-Excipients-Market-to-2026-Size-Market-Share-Application-Analysis-Regional-Outlook-Growth-Trends-Key-Players-Competitive-Strategies.html.